On the lamb front, we were on hold at 40 lambs for a couple of weeks. We were down to our oldest ewe, our youngest ewe, and another with an interesting udder. Then, the week before last, on a freezing night when we arrived home late from a concert, the oldest decided to give birth to triplets. The first didn’t live and I wasn’t sure about the second, but I’m happy to say that the second did survive and the remaining two are doing quite well. A few short days later, with the temperature in the 80s and high humidity, the youngest decided to give birth. Her lambs were very dark in color and, it was so hot, they were panting shortly after birth and could hardly nurse. Since I had just let everyone out on pasture two days before, I had to take her and her lambs back to the barn for some shelter from the sun. After a week in the barn, they are both strong and healthy and yesterday began enjoying the fresh grass again with everyone else. This week, it seems we have a little one that has come down with tetanus. It appears his lastration opened up and became infected. His legs would lock up and he was having trouble keeping himself upright. So Wednesday night, I rigged a sling in the barn to keep him upright during the day so that his digestion would continue working and I lay him in a corner at night so that he cannot roll over backward. With a treatment of liquid goldenseal root and some careful nursing, hopefully he will be back to health soon. So, we are still on hold with one ewe but after 45 births and a couple of losses, we have 41 lambs going strong and one working to get healthy. Finally, don’t forget our chicken and egg CSA offers below. Do you use a lot of chicken and have some freezer space? We will raise your chickens, as few as 10 and as many as 50. You pay us to raise them and deliver them to the butcher. You pay the butcher to have them dressed out as you like. The chickens will be heritage breeds, raised on grass in moveable pens (we’ve found that is safer out here with the hawks), and supplemented with organic feed. Please send us a message for more details. Don’t have much space but still use quite a bit of chicken. You may select the large CSA option. That consists of two whole chickens and two dozen eggs. $40 weekly. Just need a little bit. Select one whole chicken and one dozen eggs for $18 weekly. Just message or e-mail us for more information. Our first lamb watch was a great success. We had several visitors, three lambs born that afternoon, and even some escaped sheep to wrangle. As of this writing, we are now up to 20 lambs with 12 mothers yet to give birth. Come visit us Easter Sunday beginning at 1:00. I wonder how many lambs we’ll have then. We’re always re-inventing ourselves, trying to determine what we do best. After six years on the farm and beginning our 7th season, I’m sure we’ve got it down this time. So, we will not be participating in farmers’ markets after April. We appreciate the relationships we have built over the last couple of years and hope to continue those relationships, but we have decided that our time is better spent on the farm at this time. What do we do well? Sheep it seems. Why else would we have so many lambs?! Depending on how things work out, we’ll see what lamb options we may have for you later in the season. The other thing we seem to do well are chickens. We will be offering several chicken and egg options (or is that egg and chicken options?). 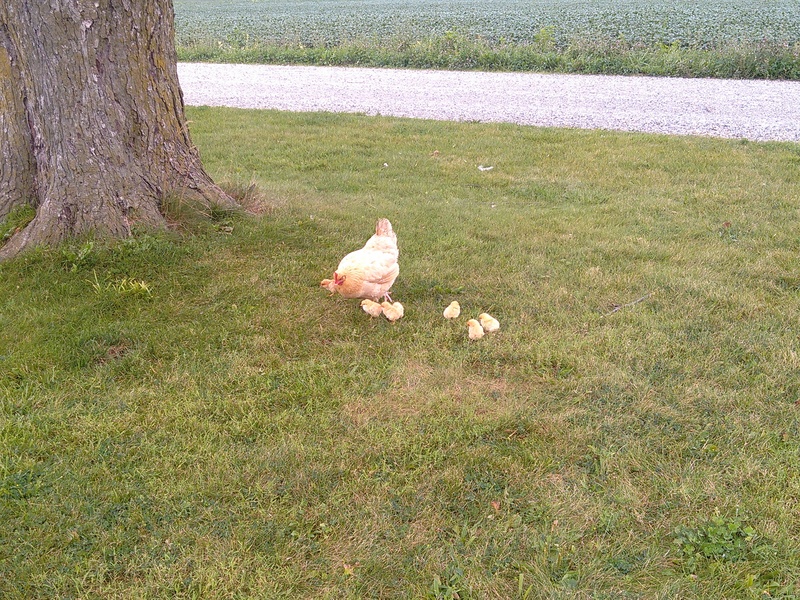 We came home from a day of sending our son off to college and found this little lady prancing around the yard with her brood. We didn’t even know she had a nest. Hopefully there’s a few more surprises in the weeks to come since our turkey hens have mysteriously disappeared recently. Friday, August 22, 4:00 p.m. – 7:00 p.m – Farm to Fork Market at Normandy Farm (79th & Marsh Road) – We’ll have eggs, pastured pork, and pastured chicken. Guinea Girl lotions, body butter, herbal salves, and lip balms will also be available. 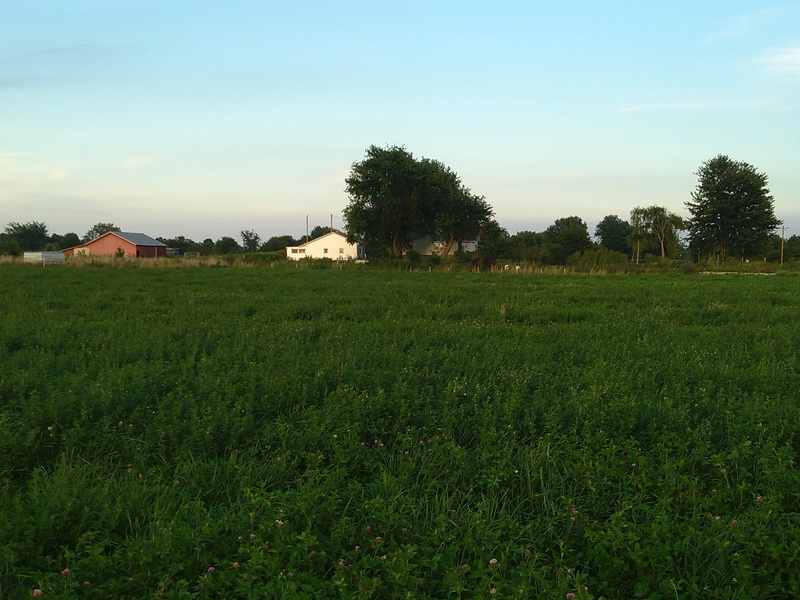 Saturday, August 23, 8:00 a.m. – 11:00 a.m – Zionsville Farmers’ Market (Main St. & Hawthorne) – We’ll have eggs, pastured pork, and pastured chicken. Guinea Girl products will not be sold at this market. Tuesday, August 26, 4:00 p.m. – 7:00 p.m – Decatur Township Farmers’ Market (5106 S. High School Road) – Guinea Girl lotions, body butter, herbal salves, and lip balms will be available at this market. We’re back in pork, in every way. We picked up our butchered pork from This Old Farm and have plenty to sell. We also bought five new piglets. 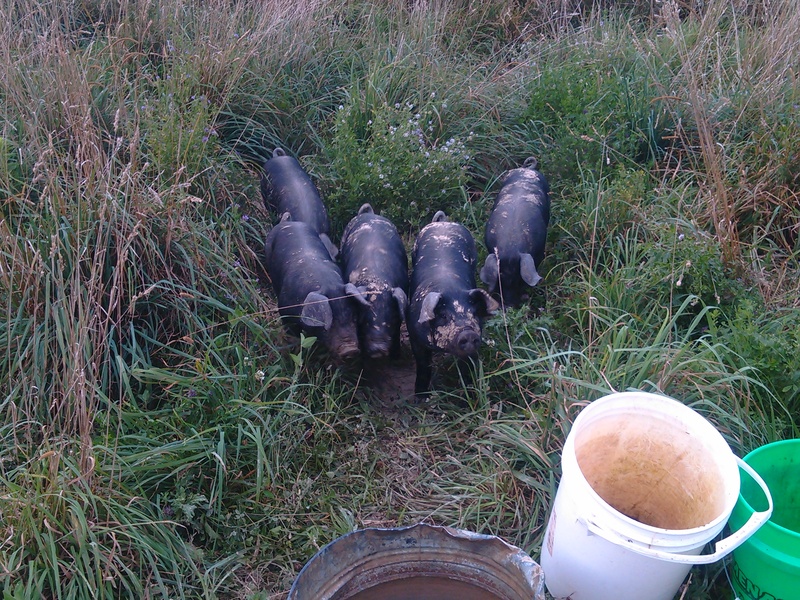 These piglets will be as pastured as pastured can be. They were farrowed on pasture and will be raised on pasture. Two of them are gilts that we hope to breed for our own pastured pigs. Friday, August 8, 4:00 p.m. – 7:00 p.m – Farm to Fork Market at Normandy Farm (79th & Marsh Road) – We’ll have eggs, pastured pork, and pastured chicken. Guinea Girl lotions, body butter, herbal salves, and lip balms will also be available. 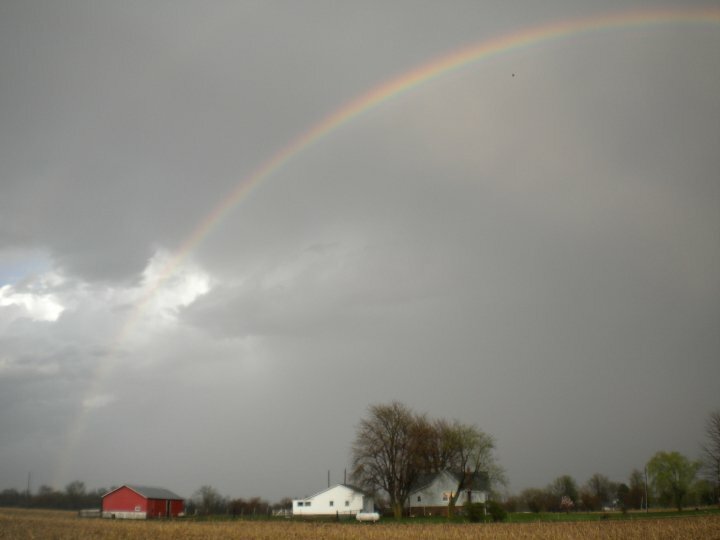 Saturday, August 9, 8:00 a.m. – 11:00 a.m – Zionsville Farmers’ Market (Main St. & Hawthorne) – We’ll have eggs, pastured pork, and pastured chicken. Guinea Girl products will not be sold at this market. Tuesday, August 12, 4:00 p.m. – 7:00 p.m – Decatur Township Farmers’ Market (5106 S. High School Road) – Guinea Girl lotions, body butter, herbal salves, and lip balms will be available at this market. Is not like the other. Can you spot the oddball? We’ve had troubles with the birds hatching their own eggs this year. 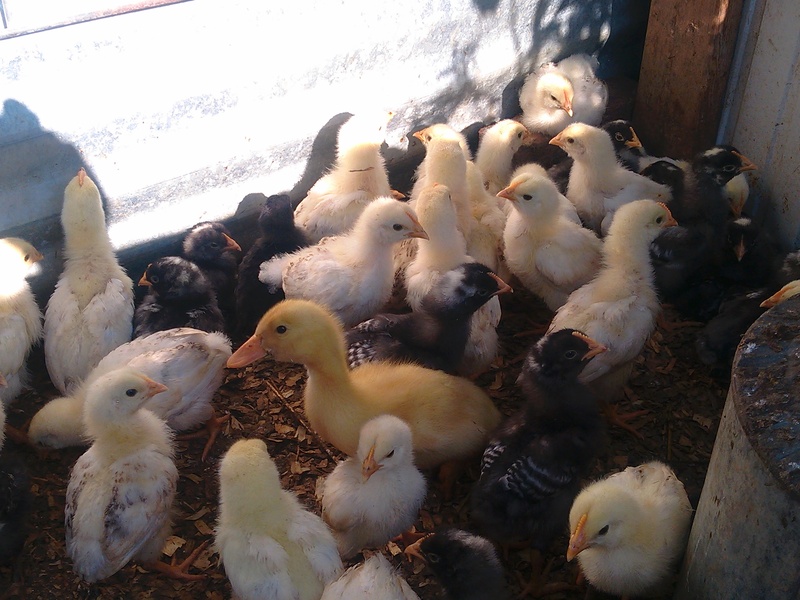 We have managed to incubate some of our own turkeys, guineas, and ducks though. Last week we hatched five ducks. We’ll probably save these to grow our duck flock next year. Friday, July 18, 4:00 p.m. – 7:00 p.m – Farm to Fork Market at Normandy Farm (79th & Marsh Road) – We’ll have eggs and pastured chicken. We’ll also have a few special lamb cuts. Betsy’s Kitchen will be bringing Paleo goodies and granolas. Betsy will also continue to bring her Guinea Girl lotions, body butter, herbal salves, and lip balms. Saturday, July 19, 8:00 a.m. – 11:00 a.m – Zionsville Farmers’ Market (Main St. & Hawthorne) – We’ll have eggs and pastured chicken. We’ll also have a few special lamb cuts. Betsy’s Kitchen will be bringing Paleo goodies and granolas. Guinea Girl products will not be sold at this market. Tuesday, July 22, 4:00 p.m. – 7:00 p.m – Decatur Township Farmers’ Market (5106 S. High School Road) – We’ll have eggs and pastured chicken. Betsy’s Kitchen will be bringing Palo goodies and granolas. Betsy will also bring her Guinea Girl lotions, body butter, herbal salves, and lip balms. The Farm to Fork Market will also be celebrating Christmas in July, a festival of art, food, and music from 10:00 a.m. to 4:00 p.m. on Saturday, July 19. We won’t be able to attend but we encourage you to attend.